Greetings Beaders! I’m here with another fun (and easy!) sparkly project brought to you by Eureka Crystal Beads! This woven bracelet works up so fast and leaves you with a stunning and substantial bracelet made with Preciosa Chatons (sold already in their metal 2-hole settings!) 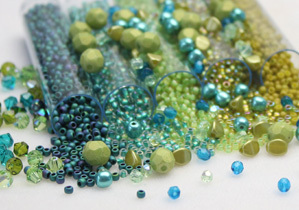 and teeny dazzling 3mm Swarovski Crystal Bicone Beads. Materials: (approx….